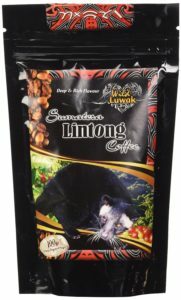 How To Make Kopi Luwak Coffee? aking a mug of coffee is easy but making a delicious cup of coffee can be an art. I am sure that you don’t want to waste your expensive kopi luwak beans because of a wrong preparation process. Fortunately, you just need to remember a few fundamental rules to prevent that from happening. 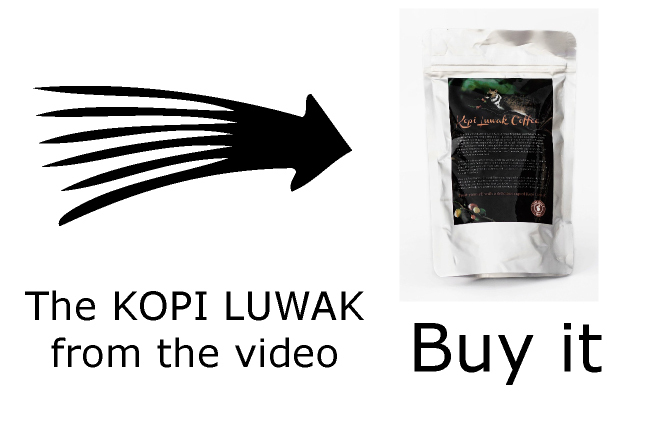 The following instructions will help you to brew an excellent Kopi Luwak Coffee. However, you should also consider these instructions for every other coffee you make. It is simple: The higher the quality of the beans, the better the coffee. 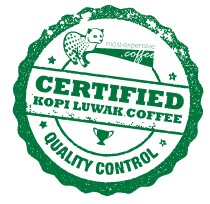 If you buy kopi luwak coffee beans make sure to buy them only from certified shops. The coffee beans should be as fresh as possible. Whole beans are better than ground beans because they are more flavorful and will add a fresh taste to your coffee. Moreover, never store coffee beans in a freezer since the beans will lose all their flavor once brought from the freezer to a warm temperature. Keep your kopi luwak coffee beans away from excessive air, moisture, heat, and light. It is better to store your coffee in an air-tight container and keep it in a dark and cool place. Did you know that 99% of coffee is water? Make sure that you use just the best and freshest water for your coffee, especially when you are preparing kopi luwak coffee. If your tap water smells or tastes bad, use bottled water for your coffee instead. Make sure that you buy a good coffee grinder. 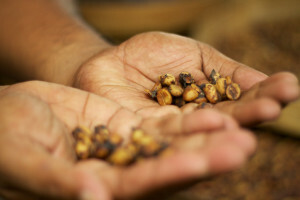 Grinding coffee properly is a crucial step in creating a perfect cup of kopi luwak coffee. It is important you grind your coffee specific to your favorite brewing method. Here is a list of the five most popular brewing methods along with the specific coffee grind size. Extremely Fine/Turkish Grind – Like flour, very powdery. Remember: Just grind as much coffee as you need. 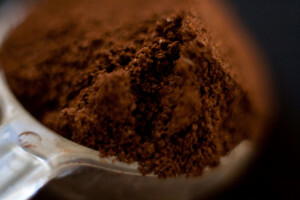 You should avoid grinding more because ground coffee loses it’s aroma very quickly. 4th Rule: Use the right water temperature. It is important to use the right water temperature especially when using a drip coffee maker or preparing a Turkish coffee. Using the wrong water temperature can destroy the flavor of your coffee. The ideal water temperature for coffee is 95-98 C (203 – 208 F). Temperatures above this will increase the acidity of your coffee, and colder water will not extract enough caffeine and flavor from the coffee beans. Never reheat your coffee; it will lose its flavor. Better to pour it into a thermos bottle or carafe to keep it hot. 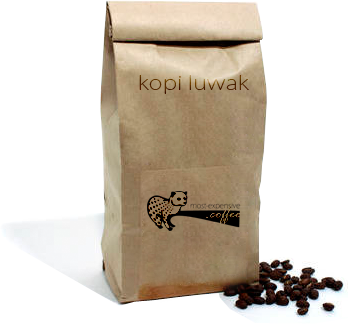 Milk, cream and sugar will ruin the taste of your kopi luwak. 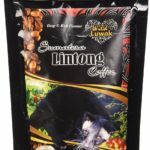 Even if you prefer drinking your regular coffee with these ingredients, I recommend you not to do it, when you are drinking kopi luwak coffee. If you add anything it will taste just like regular coffee, and you will not be able to taste the special flavor of kopi luwak coffee. 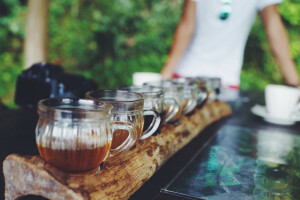 How to brew a mug of kopi luwak (or any other coffee)? Espresso machines are used to brew coffee by forcing pressurized water near the boiling point through an extra fine coffee grind. It produces a thick concentrated coffee called espresso. In order to produce a good tasting espresso, it is important that you grind the coffee beans extra fine and use fresh, clean water for your coffee. This is, perhaps the most common method to make coffee. 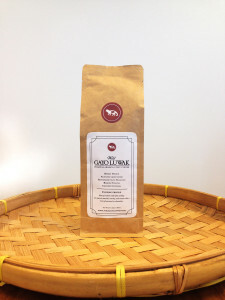 Grind the kopi luwak coffee beans to a medium grind and use fresh water as always. When using a drip coffee maker it is very important to get the water to coffee ratio right. In general, it is recommended to use 1-2 tablespoons of coffee per six ounces of water, but you might want to play around to adjust the coffee to your specific taste. The french press is a simple coffee making device. It requires a more coarse coffee because finer coffee would slip through its filter. Coffee and water are added using the following proportions: 28 grams, or 1 ounce of coffee to 450 ml or 15 fluid ounces of water. Coffee is added first. Never use boiling water. The ideal water temperature is 95 – 98 C, 203 – 208 F. Pour as much water inside the french press as you would like to drink. To begin, the lid and plunger of the french press are pulled all the way to the top. 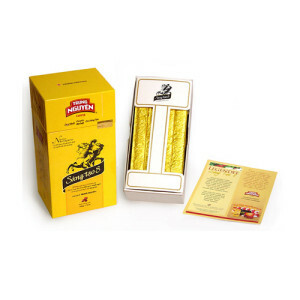 The coffee should brew about 4 minutes, but you can adjust the time to your personal taste. The longer you brew it, the more bitter the coffee becomes. When the coffee has brewed long enough, push the plunger down to the bottom. This will also push the coffee down to the bottom of the press and separates it from the brewed coffee. 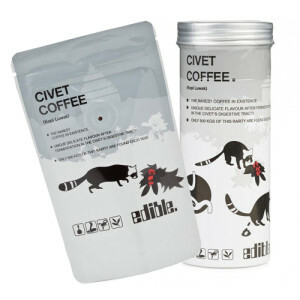 Now your civet coffee is ready. This is the most traditional way to make coffee. You need a special (cezve) coffee pot to brew coffee with this method. Use between one and two teaspoons of coffee per cup. Coffee beans used for Turkish coffee are ground to the finest possible powder like flour. They should be finer than for any other preparation. The fine coffee flour is put in the pot first, after that cold water is added. Heat the pot on medium low for a short time and stir the coffee till it dissolves. It is important you don’t stir again. After a minute a layer of foam will start to build up on the surface of the pot. 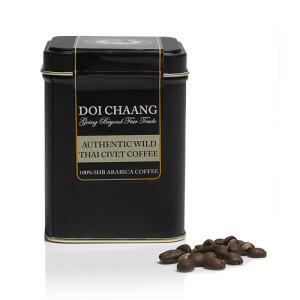 When the foam rises to the top of the pot, remove it from the heat and serve your Turkish kopi luwak. 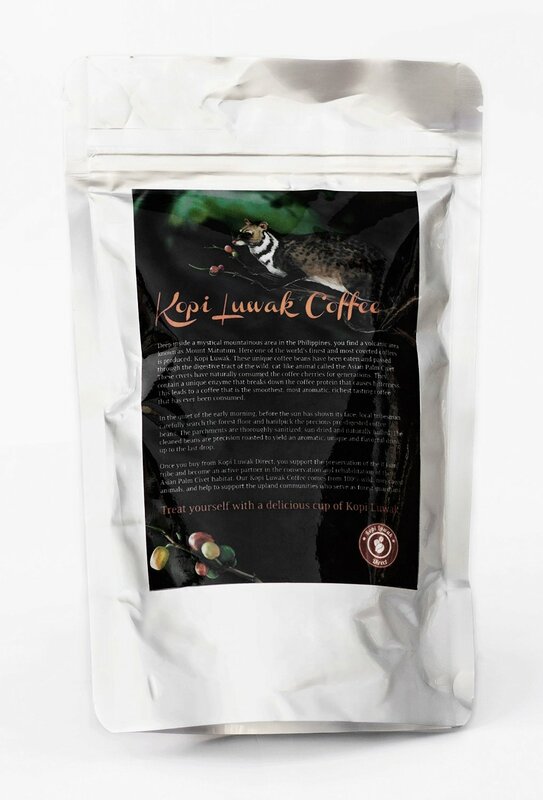 Enyoy your Kopi Luwak Coffee! 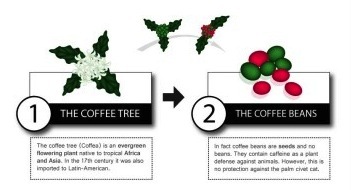 (Learn more about this special coffee). To cheer up your morning drinking experience just use a funny coffee mug or unique coffee mug from Coffee Mugs (www.coffee.mugs).